Grave of the fireflies is one of those rare watershed movies that redefines its genre. If you are one of people that doesn't believe Manga is a serious medium of communication, prepare to have your eyes opened. Ill start out by saying I don't really like this movie per se, mainly because it deals with themes that no one would normally want to watch, namely war and the grief it creates. However, it is these very themes that make this one of the most profoundly emotive films I've ever seen. Watching the kids go through some of the stages of grief and how it was affecting their lives was a truly devastating. If you watch this film and then try to deny the power of Manga then you are either emotionally deficit or in denial. The original story was a semi biographical account by Akiyuki Nosaka on the loss of his sister in the war. The story line itself is very simple, but it is the animation by the acclaimed Studio Ghibli that really distinguishes this film. 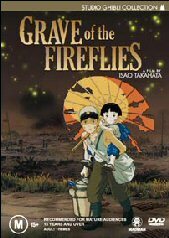 Grave of the fireflies was actually made in 1988, but has been digitally re-mastered for re-release (see extras for more details). The characters themselves are drawn in the conventional large eyed Manga style, and the backgrounds themselves are quite static. However it is the choice of backgrounds, realistic character actions and the dialogue that combine so well to create this study in expressive excellence. Grave of the fireflies a the story of two children; Seito (the older brother) and Setsuko (the younger sister) who are living in Kobe, Japan at the end of WWII. One day Kobe is bombed by the allies, and their whole neighbourhood is razed. They lose their mother and never hear anything further from their father. Consequently, they are forced to move to their distant aunts place in another city. A brilliant train scene marks the transition between their old lives in Kobe and their new life with their aunt. The kids new life does not go well, and you can see the shock as a reaction to their trauma, expressed in the way they don't really interact with anyone but each other. Eventually they move out into an abandoned shelter and fend for themselves. It is from this setting that the title of the show is taken. One night they decide to take fireflies from the creek and place them inside their mosquito netting to create light. Its definitely one of the most beautiful and moving scenes in any film, especially as this is where you can see this is the beginning of the end. Setsuko eventually becomes malnourished which forces Seito back into the real world, but in the end it is too late. We are then brought full circle to the starting scene, and the story ends in a place of transition. This is not a film you are going to walk away from feeling good, and most people would probably not watch this film a second time. Whatever you take away from it, I guarantee you will walk away amazed at the power of Manga expression at its best and the genius of Studio Ghibli in evoking empathy with the characters. 16:9 Widescreen The character animation comes across as a smidgin dated in this feature, but considering it was first released in 1988 this is not a problem. Realism of character was never a goal in this film, but if you have a look at the background you may well be surprised. There are some beautifully drawn scenes, especially the engaging cityscapes. One thing that Studio Ghibli does very well is train scenes (think "Spirited Away"), and the train scenes in this film are no exception. The meditative fusion of train noises and passing scenery is done exceptionally well in this movie. Do yourself a favour and watch them a couple of times. English and Japanese 2.0 with English subtitles. The background sounds to this feature are very good as is the silence in this film. Lack of dialogue is used very well to create a point or give the viewer time to absorb what is going on. Watch for the timing of some of the bombers, they are used to dramatic effect to reinforce the prevailing mood. The English translation in text and words are also appear very precise and acted well. This is definitely one of the best extras I've seen . The interviews are relatively interesting and the alternative angles storyboard is a really good look at how the animation is done. - Historical Perspective commentary by an American and Japanese professors.